If you’re visiting Bentonville, Arkansas, one of the first things locals will direct you to is the Walmart Museum. The storefront in the city’s town square is home to the first Walmart ever, Walton’s 5 & 10, which now pays homage to the multinational business behemoth’s humble origins. Visitors learn about founder Sam Walton and view photos of his dog, they can print out stickers with their name written as a bar code and purchase vintage candies or various iterations of Walmart schwag. It’s an experience not to be missed if you’re a Walmart fan. Except last Saturday it was an experience dozens of people missed, including a group of teenagers eager to show their out-of-town guest the heart of Walmart country. The teens strode up to the door and pulled on the handle impatiently until noticing the “Temporarily Closed” sign. Police officers standing by tried to comfort them. “You can come back tomorrow,” they offered. The teens were having none of it. “I can’t believe they are closed! And for … this?” a young woman asked rhetorically, gesturing toward the street. Just as she didn’t notice the closed sign on the glass door, she may have missed the snipers perched on the Museum’s roof and the facing court house, paid no mind to the small cluster of black and camo-clad neo-Nazis the police were surveilling about 10 feet away from her on the sidewalk, nor the 450 or so peaceful protestors amassed behind barricades in the town square park. 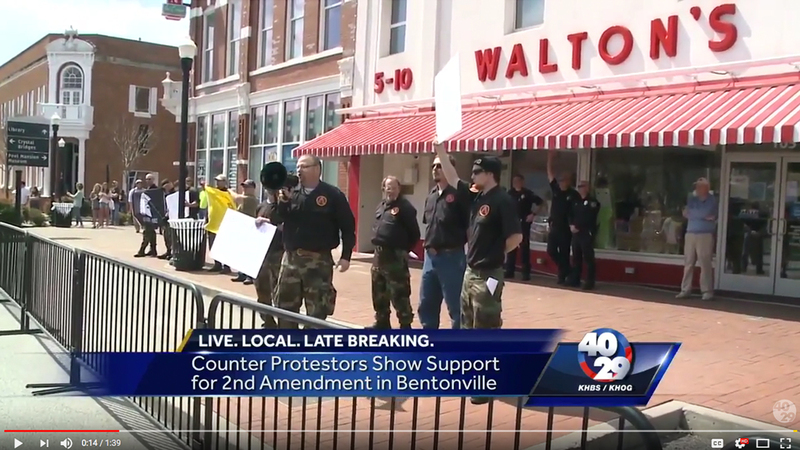 The scene in Bentonville, a town of about 45,000 people in northwest corner of the Natural State, was part of the nationwide March for our Lives protests against gun violence, and the Walmart Museum wasn’t the only business to close that Saturday; nearly all of those facing the square decided not to open. And not out of fear that the crowd of mostly teenagers and their parents — who would close the event singing “We Shall Overcome” in unison — would become unruly, it was mostly out of concern for the counter-protesters which would count among them washed up, wannabe neo-Nazi leader Billy Roper and nine of his “white nationalist prepper” ShieldWall Network followers. Yes, there was a pair of middle-aged women with a 2nd Amendment sign, a gaggle of NRA members and a posse of III%ers called the Freedom Crew among the 40 or so counter-protesters (who all kept their distance from the racists), but it was Roper’s group that law enforcement, drones and the media were focused on. Two hours before the March for Our Lives protest was set to begin, Bentonville’s town square was like it is most Saturdays, with people milling around chatting, parents taking toddlers out for a stroll and dogs of all sizes and temperaments being walked. The only scuffle of the day would be two yippy terriers getting into it on the corner. Friends met up with each other and chatted, law enforcement was vigilant but relaxed as one officer made his way around the periphery of the metal barriers distributing photocopied maps of the square to his colleagues. Just before 11 a.m. the first of two drones began buzzing the square as a man in a Hiwaymen shirt and six people in blue shirts emblazoned with Freedom Crew and bearing a III% logo on their sleeves arrived with flags. They were told by police that the tiny wooden flag poles attached to the flags they were carrying — half U.S., half Confederate — would need to be removed before they could enter the square. They snapped off the tiny dowels and strutted into the park. One of the members draped a Gadsden flag over her shoulders like a cape while a little girl nearby did cartwheels in the grass. A man wearing an “All Rifles Matter” tee shirt who would later join up with Roper’s uniformed ShieldWall members, led a member of the Knights of the Ku Klux Klan named Marshall to a spot in front of the closed museum. Marshall pulled an antiquated video camera from a large blue duffel bag and placed it on a tripod. He would film Roper’s crew for altrighttv.com, pausing at the end of the day to pose with Roper’s men, before retreating to the shade where he removed and inspected his teeth. Roper’s crew assembled in front of the Museum where Marshall was filming and raised their signs, standing in silence for the moment as people inside the park’s barriers looked at them quizzically, if at all. And when the rally finally began to loud cheers, the onlookers turned their backs on Roper, leaving law enforcement as his only audience. That didn’t sit well with Roper, who is notorious for attention-seeking behavior and self-aggrandizement, and considers himself in the “top tier” of American racists. The truth is, Roper is not a charismatic leader and has trouble recruiting followers. After leaving the National Alliance in 2002 he tried to form a group called White Revolution which eventually fizzled out. In 2011 Roper announced that White Revolution was over, admitting failure after nine years. He would go on to affiliate himself with a Klan group. “They are saying what America needs to hear, in a way that more white Americans are willing to hear it,” Roper wrote. 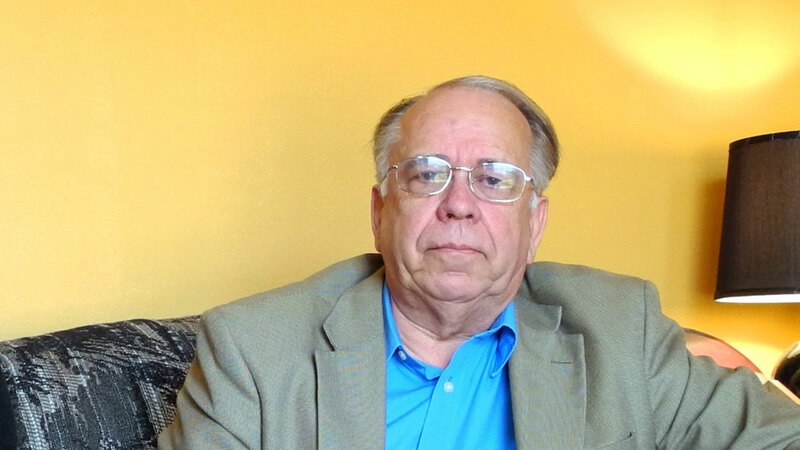 “That is why, as a Christian Identist, I will be applying for association in the Knights Party led by Pastor Thomas Robb,” he said at the time. Most recently, Roper declared himself leader of the ShieldWall Network, a last-ditch effort to remain relevant as a white nationalist. Hence his determination to seek out media coverage, which led him and his crew to constantly change positions, trying to get television and print media to pay attention. As they relocated around the square, so did police and sheriff’s deputies inside and on the periphery of the park, as well as the drone buzzing overhead. Roper gave interview after interview, and eventually, realizing people were more interested in what the protesters had to say about gun violence than a rag tag group of costumed racists, he pulled out his bullhorn which he put in police siren mode, a deafening cacophony. “What you are doing is pushing us toward civil war,” he shouted at the disinterested crowd, then led his group in a weak round of chanting “Shall not be infringed!” before starting back up with the police siren. Local reporters knew him by name, and when Roper left most of his crew unattended as he walked down the sidewalk for an interview, the hapless racists began getting tough questions from a man in the crowd. “What is Craig’s List?” one of Roper’s men shouted back incongruously, then hid his face behind a sign and consulted with his comrades. “What’s that word mean?” he asked anxiously. “I don’t know! I didn’t write the sign!” the man responded in a hushed tone. Knights of the Ku Klux Klan's Thom Robb attended the rally but did not stand with Roper. As things wound down, Klan leader Robb and his daughter Rachel attempted to blend in with the protesters rather than stand in support of their old friend and associate Roper, but Robb did make it a point to congratulate them in front of the cameras. “You guys are doing a good job, can I shake your hand?” he said before inviting Roper to a racist conference on his compound in April. The rally ended without incident, the police barriers were removed and the streets opened to traffic. The Walmart museum, too, returned to normal operation. Prone to magical thinking, Roper was quite pleased with his group’s performance and particularly his own manipulation of the press.